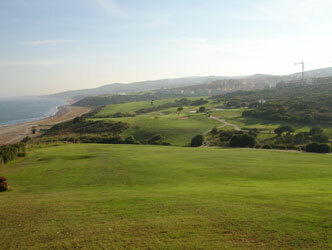 Alcaidesa Golf Course is the only links course available on the Southern coast of Spain. The views over the mountain of Gibraltar and Africa are breath taking. This can be a challenging course to play in high winds or a gentle and scenic round in calm winds. It is quite an experience either way when playing Alcaidesa. Erbudande 8x7-1 gratis, gäller tom 31.12.14. Hotel i närheten: Vista real apartments, ligger precis brevid bana. San Roque bungalows, ny renoverade rum och bungalows, värd för Ryder Cup 1997.